NCVA membership just got sweeter, when Ottawa’s beloved Auntie Loo announced that she wanted to show NCVA members some love with a 10 per cent discount. The discount applies to anything purchased at her store front (507 Bronson Avenue) or ordered, except for wedding cakes. 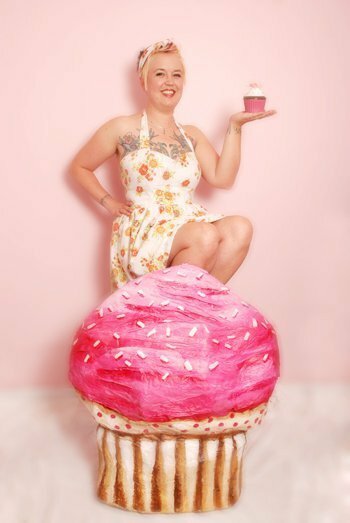 While her baked goods have been available at Ottawa area natural food stores for several years now, Auntie Loo opened her storefront one year ago, much to the delight of vegans and cupcake enthusiasts. It was the culmination of many years of hard work and perseverance. “I wasn’t sure what I wanted to do with my life. I was in a band and working at a coffee shop. I would make these cakes for my friends, and someone told me I could make a lot of money selling them,” Auntie Loo explains. Was she ever wrong. The same friend talked her into selling her creations at a Ladyfest Craft sale in 2004. She was a hit. Inspired, she completed a small business diploma program at Algonquin College, and joined the Youth Entrepreneurship Program, which gives young people a salary while they get their business started. She baked her heart out while renting space at a bakery that was closed overnight. Fellow vegan baking aficionado, Brad Campeau of B.Goods cookies, mentored her. She built a loyal following through LadyFest and other events, and by having her goods in health food stores. But then the Youth Entrepreneurship Program ran out, and she was at a crossroads. “It was do or die,” she says. With help from the Canadian Youth Business Foundation, she was able to find and rent her own retail location, on Bronson Avenue. She’s also expanded her wedding cake business, with help from her “right hand man” Kate Veinot. Auntie Loos currently has two part time employees, and two volunteer pastry students from Algonquin College. Her repertoire of treats is constantly changing with the seasons, but the one constant is that they’re always vegan. There are also soy-free and gluten-free options. Treats include a wide variety of cupcakes, squares, pastries, brownies, and cakes. She caters special events and welcomes special orders. “I never expected a response from the community like this. It’s been awesome,” Auntie Loo says. “People like to come in and see where the food is coming from. It’s important to me to be really transparent.” Auntie Loos uses organic products whenever possible, and works with and purchases from small local businesses. Her love of animals has inspired her along the way. “I really love animals. The reason I went vegetarian was because a cow truck passed me on the highway when I was five years old. That’s when I realized how meat was made,” she says. She’s been vegan for more than 10 years. Previous PostVeg Fest ’09 and ’10Next PostHave you been to Cafe My House?